North Korean state media has said it was "self-confidence" and not sanctions that drove it to seek talks with South Korea and the US. The commentary in KCNA comes after US President Donald Trump accepted an invitation to meet North Korean leader Kim Jong-un. The report went on to criticise "small-minded" critics who questioned North Korea's motives. Details of how the Trump-Kim meeting might take place are still not clear. If it goes ahead, it will be the first ever face-to-face meeting between sitting leaders of North Korea and the US. 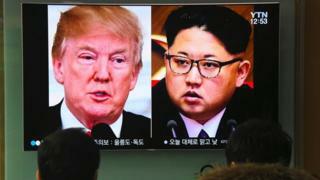 The US had in February imposed a fresh set of sanctions on North Korea, its largest ever, in what Mr Trump called a "maximum pressure campaign." The KCNA editorial did not make any direct reference to a possible summit, but said its "peace-loving proposal" had caused a "sign of change" in Pyongyang's relationship with the US. It appears to be the first time it has mentioned a shift in North Korean policy towards the US since reports of a possible summit emerged. "The dialogue peace offensive of the DPRK is an expression of self-confidence as it has acquired everything it desires," said the commentary, released on Tuesday. It said it was "rubbish" to say it came to talks as a "result of sanctions and pressure", saying that was an "expression of small-mindedness... for riff-raffs to spoil the atmosphere". Trump and North Korea: Are sanctions the reason for talks? Is North Korea just playing the US? Discussion of a meeting emerged earlier this month. Mr Kim sent a message to Mr Trump - via South Korean officials - saying he wanted to meet and was "committed" to giving up North Korea's nuclear weapons. Mr Trump accepted the invitation, but there has not been no comment since then from the North Korean leadership on the summit. The move was seen as a major breakthrough after a year of turbulent diplomacy and threats of violence. South Korean President Moon Jae-in, who is himself due to meet Mr Kim later in April, on Wednesday also hinted that a three-way summit could be in the works. "A North Korea-US summit would be a historic event in itself... depending on progress, it may lead to a three-way summit between the South, North and the United States," he said. A thaw in relations between North and South Korea first began in the lead-up to the Winter Olympics, which saw both countries march together under the same flag. Seoul and Washington also delayed its annual drills until after the Winter Olympics, which is said to have fostered conditions for inter-Korean talks. The annual military drills will resume next month. Trump and N Korea: Are sanctions reason for planned talks? US-North Korea talks: What could happen now?